These unique ornaments are hand painted in Bar Harbor, Maine. Santa�s face is painstakingly and colorfully painted on hard shell lobster claws. Each claw measures about 3 � - 4� tall by 2� wide. 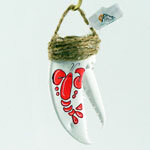 Each is a three dimensional lobster claw ornament finished with twine for hanging.